With three-quarters of the 2018 season complete, the Chatham Anglers (16-15-2) will look to start the home stretch of the season off on the right note. Chatham travels to Lowell Park on Friday to take on the Cotuit Kettleers (14-15-3) in the third meeting between the two teams this summer. 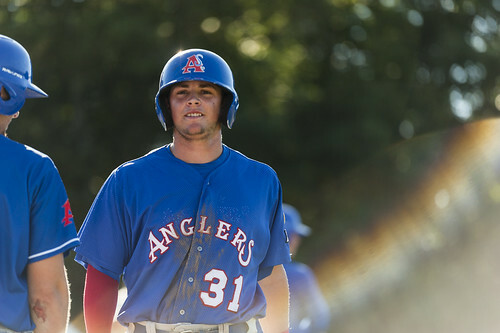 The Anglers are coming off a 17-3 blowout win over the Brewster Whitecaps on Thursday. The game was the A’s best offense performance of the season. Chatham scored in every inning but one, as every player who registered an at-bat reached base and each position player who played scored a run. The team had more walks (15) than hits (12). Blake Sabol (Southern California), Spencer Torkelson (Arizona State) and Kyle McCann (Georgia Tech) all drew three walks and all nine starters earned a free pass. Colin Simpson (Oklahoma State) continued his tremendous stretch of hitting with two hits, including one triple, and a team-high five RBIs. Ashton McGee (UNC) added two hits, two runs and two RBIs and Greg Jones (UNC Wilmington) knocked two hits and two RBIs. Cotuit won both previous contests over Chatham this year. On June 24, the Kettleers won 6-1. That game was supposed to be game one of a twin bill at Veterans Field, but the second game was abandoned due to fog. The second official contest — held at Lowell Park on July 1 — was a heartbreaking loss for the Anglers. Alek Manoah (West Virginia) was unhittable in four innings on the mound as his fastball touched 97 miles per hour. But once Manoah came out, the Kettleers took advantage by plating three runs in the fifth. Simpson hit a sacrifice fly that scored two runs in the sixth to close the gap to one before Austin Wilhite (Georgia Tech) scored on a wild pitch in the ninth to send the game to extras. In the 11th, Beau Brundage (Portland) sent the home fans away happy as he lofted a walk-off home run to seal a Cotuit victory. The Kettlers are coming off a 7-2 victory over the West Division-leading Hyannis Harbor Hawks. Cotuit scored four runs in the second inning, with Garrett Wolforth (Dallas Baptist) knocking in two runs on a double and Jonathan Robertson (Creighton) knocking in two runs on an error. The Kettlers added three more runs in the fifth inning to seal the win. The Kettlers have struggled at the plate all season. The team is hitting .232 — third-worst in the league — with 241 hits — second-worst on the Cape. No player on the roster is hitting over .300. Brady Smith (Florida) leads the team in hitting with a .294 average and Duke Ellis (Texas) has a .404 on--base percentage with 13 walks in 54 plate appearances. All season, Anglers manager Tom Holliday has talked about his desire to start off games on the right foot.